Father's Day is fast approaching. (Hint: It's June 16th this year). 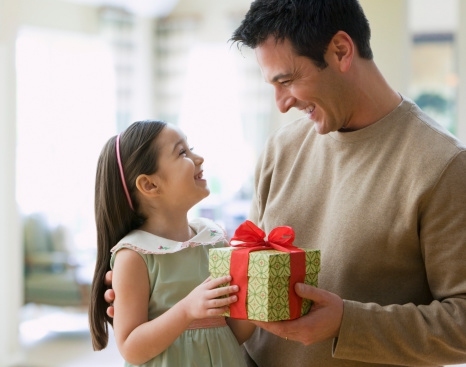 Have you or the kids gotten Dad the perfect gift yet? Have no fear. There are plenty of options available no matter the Dad. Do the yard work for him. Everyone pitch in now. Let him spend the day in the recliner or on the couch with the kids at his beck and call. Unlimited back massages (and foot massages if you dare). All hands on deck. Time to watch replays of his favorite sports team (or television shows if he's not a sports fan). Peace and quiet — which means Mom might have to take the kids out for a bit. Wash and vacuum his car for him. Let him nap. All day. A new jersey of his favorite player. That new "smart" television he's been eyeing. Tickets to a concert featuring his favorite band from his glory days. Tools. You know, so he can fix stuff for Mom. A subscription to his favorite magazine. A tablet so he can watch his favorite teams, read about his favorite teams, and play some games. A subscription to a sports network, Netflix, or HuluPlus so he can watch what he wants when he wants. Meat. Seriously, meat. Grab your grill and fire it up. A family portrait created by each child. Homemade card listing your children's favorite things about Dad. Gift basket of his favorite snacks, magazines, DVDs. All about Dad from a child's point of view. Personalized stepping stones for your yard. A collage of your child's favorite pictures with Dad (maybe from family vacations or a day at the beach). A booklet of coupons good for hugs, help with the housework, and anything else the kids want to give to Dad. An ice cream sundae — with as many toppings as the kiddos want to add. There is still time left to get or create the best father's day gift ever, so round up those kids and get started!